January: Close up of a black and white cow head. Profile shot with horns. February: Mexico cows on local farm ranch. March: Indiana cows with newborn calf. May: Gorgeous white Mexican cow near a deep green tree. June: Three golden brown cows so similar, they could be triplets. July: Texas range cow with clipped horns. 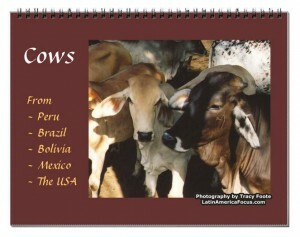 August: Brazil ~ black, grey, and brown cows with huge ears! September: A black bull with a brown cow from an animal market in Bolivia. October: Gorgeous face! Peru calf profile head tied near a clay wall near Lake Titicaca, Peru. November: Mexico herd cows with sprinkles of hay on their faces.